Remember when David Rosenberg flipped from bear to bull, claiming that inflation - especially for wages - had finally arrived back in 2012 (spoiler: it hadn't)? That odd phase lasted a few years, but the former Merrill strategist is once again back to his bearish self. Permabearish that is, because in a presentation to Canada's Inside ETFs conference in Montreal, Rosenberg echoed Morgan Stanley's Michael Wilson in stating that January was the "peak of the bull market", and that the next recession will start in 12 months. Rosenberg's bearish case is familiar to those who follow him: the market is in a classic late cycle, wages are rising thanks to full employment, while commodities are cooling amid potential trade wars. What happens next? "The result will be higher inflation", he said, which is odd because the last time Rosie saw higher inflation it made him bullish. "We are seeing a significant shift in the markets. The Fed was responsible for 1,000 rally points this cycle so we have to pay attention to what happens when the movie runs backwards." (Some of us still recall that Rosie made no mention of the Fed's contribution to the S&P during abovementioned bullish phase). 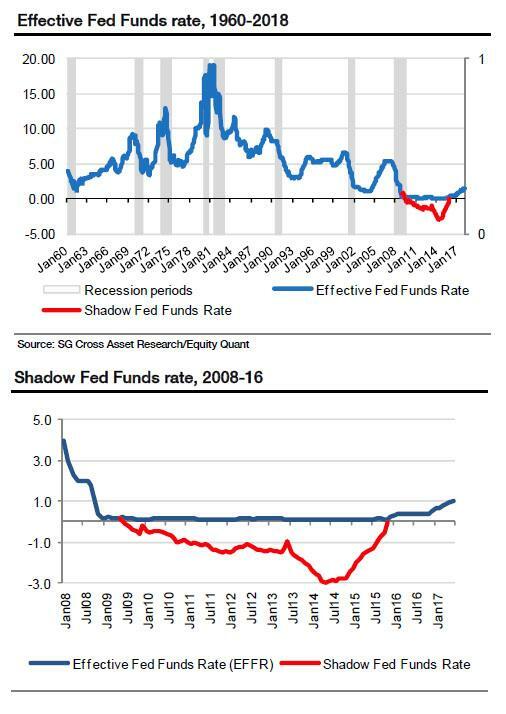 The Shadow Fed Funds rate hit negative 3% in mid-2014, but more importantly that a pronounced tightening cycle actually started through 2015, and by the end of that year the Shadow rate had converged back with the effective nominal Fed Funds rate (see charts below). ... although the six Fed Funds rate hikes since Dec 2015 amount to a total of 170 basis points (bp) of tightening, one can argue that if we add the 300bp (Shadow) rate hike to the current Fed Funds rate of 1.70%, the degree of monetary tightening in the current cycle stands at 470bp. "it is therefore reasonable to argue that the US has already faced a "normal" tightening cycle and any additional rate hikes are taking us into territory not seen in recent times. This already may be enough for the Fed to have broken something." If the Fed raises rates and shrinks the balance sheet as much as it says it will, the cumulative de facto tightening by the end of 2019 will have totaled 525 basis points. He's right, but what he forgets is that the second stocks drop by the maximum permitted 20%, the Fed will immediately halt the tightening cycle, and proceed with rate cuts, NIRP, QE4 and so on, because in the current, final phase of the global asset ponzi, even a small loss of control means the entire financial system gets it.